ESVAGT’s cooperation with the schooner Fulton has led a few young people to dream about a life as seaman. West Gamma 25 years on: Facts, interviews, etc. Whilst being towed from the Norwegian sector, the accommodation platform, West Gamma, was hit by a violent storm on the 20th of August 1990. 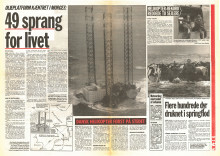 On the night of the 21st of August 1990, ESVAGT rescued 46 people from the capsized accommodation platform, West Gamma. 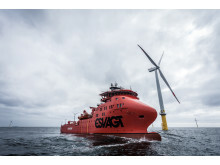 An operation that proved to be pivotal for ESVAGT. The rescue of the crew of the West Gamma is one of ESVAGT’s finest hours. These are the experiences of four key people from that August night 25 years ago.